36mm steel case, 12mm thick, fluted crown with a synthetic cabochon-shaped spinel, steel bezel with 54 brilliant-cut diamonds totalling 0.78 carats, mineral crystal, silvered dial with sunray effect, automatic movement, steel bracelet with wrist size 180mm. Water resistant to 30 meters. 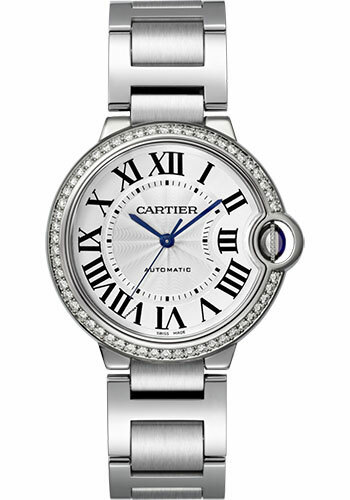 36.6 mm by 12 mm thick stainless steel case, stainless steel fluted crown set with a blue synthetic spinel cabochon, sapphire crystal, silver dial with Roman numerals and blued steel hands, caliber Cartier 690 quartz movement, white alligator strap. Water resistant to 30 meters.